I'm creating a list with PnP with an allready existing content type and then I'm trying to add a custom view with the columns from that content type. The problem is that the view gets created but it only have some of the columns and it is random witch columns gets added when i run the function. 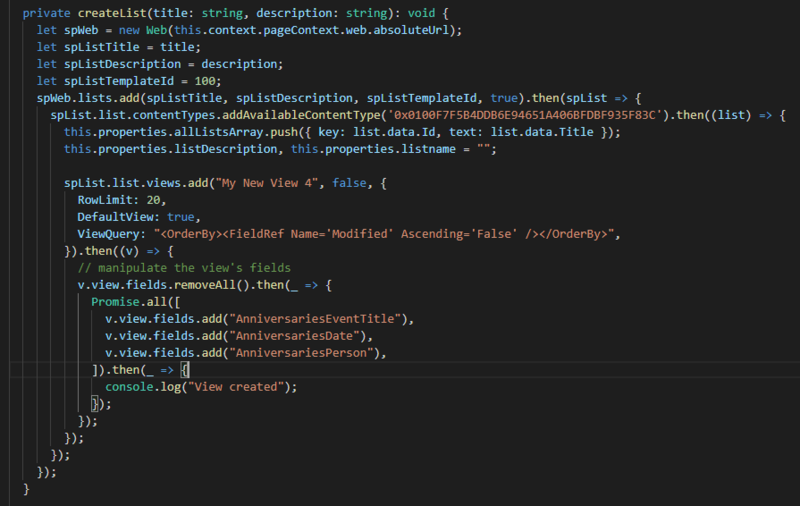 Here's the code that creates the list with existing content type and adds the view. This is something that is unique to SharePoint list views and not in a good way unfortunately. Even I learnt it when I tried your code. To add columns to the list views, they need to be done one after the other and not in parallel. Perhaps that is why you got tripped up. Not the answer you're looking for? Browse other questions tagged list spfx view sharepoint-framework pnp or ask your own question. Use an existing Content Type when you create a new list with PnP-js in SharePoint Framework?